This is truly a time of many graces. To have this canonisation in the Year for Priests is a great gift. Fr. Damien has always been a favourite of mine. I wish I could have been at his canonisation. Since being a teenager I have been a devotee of this inspiring priest. he was a man of great courage and love. He was a man of prayer and action. When he went to Molokai he found bodies that had not been buried. He set about making coffins. As he began to tend the wounds of the lepers he found the stench unbearable and smoked a pipe to steady his nerves and his stomach. He is no "plaster saint", but a man of strong will and determination. What a wonderful model for priests in this pagan age. 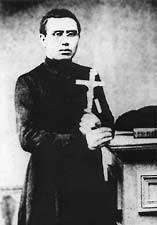 St. Damien pray for us and all priests.